Japanese Prime Minister Shinzo Abe said he will not be visiting Pearl Harbor to reciprocate President Obama’s tour stop in Hiroshima, Japan. Abe has said that while he "wholeheartedly welcomes" Obama’s decision to visit Hiroshima, he has no plans to visit Pearl Harbor. He did visit the United States last year to commemorate the end of World War II. As part of his Asian tour Obama stopped in Hiroshima, the city that was destroyed by the first deployed atomic bomb during World War II. The purpose of Obama’s visit was to reflect on and honor all those who had died during World War II. 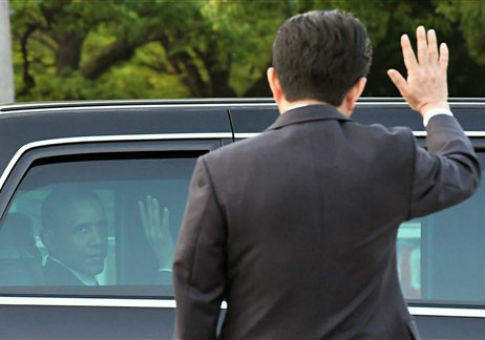 Obama’s visit made him the first sitting U.S. president to visit Hiroshima. While there, he gave a speech calling for peace and reflecting on the destruction and chaos caused by the atomic bombing of Japan. The president met with survivors of the atomic bomb and attended a ceremony at the Hiroshima Peace Memorial Park to honor over a dozen American prisoners of war who died in the blast. During President Obama’s visit, Abe said "Seventy-one years ago, back in 1945, two atomic bombs were dropped. And in Hiroshima, numerous citizens sacrificed their lives and even now there are those of us suffering because of the atomic bombing." This entry was posted in Politics and tagged Barack Obama, Hiroshima. Bookmark the permalink.